Tangent EVO4i adds iPhone dock to active speakers | What Hi-Fi? 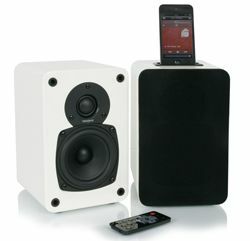 Tangent Audio has launched the EVO 4i active speaker system and iPhone/iPod dock, yours for £249. Following in the footsteps of the Tangent EVO 4 stereo speakers, the EVO 4i system has a universal iPhone dock, 3.5mm audio input and a composite video output for sending video from your Apple portable to a TV screen. Standing 14cm tall, the speakers have a 2-way bass design, 25 watt power output and a remote control that gives you full control of your iPod/iPhone. Available in high gloss black or white, the Tangent EVO 4i system is available now for £249.